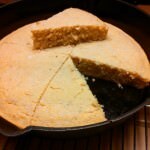 Meatless Navy Bean Soup and Corn Bread”Back in the olden days” it was said that Monday was wash day and Meatless Navy Bean Soup was the day’s meal. 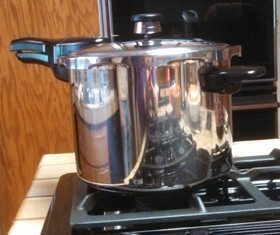 Pressure cooker speeds up the cooking. A pot of beans on a busy day is a good day’s meal . 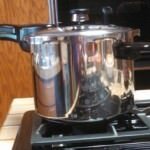 I like to cook the dried navy beans in the pressure cooker then store in pint jars ready for use in soups, stews, with vegetables or baked beans. I do not put meat in bean soup, mainly for health reasons there is no ham. Though wouldn’t ham, bacon, pork or even chicken be a good addition? That gets to be your choice. This was 1 1/2 cups of dried navy beans, soaked in 4 cups of water for 4 to 8 hours. After they are drained, I put them in the pressure cooker add enough water to cover about 1/2 inch, no salt or seasonings at this time. They are cooked for 11 minutes under 15 lbs. of pressure. I turn off the heat and let the pressure come down slowly before opening. I like a softer bean for soup, the reasons for the longer cooking. This makes 2 pints of beans and the broth. Best to follow your pressure cookers instructions. OR simply buy 2-3 cans of navy or great northern beans. I like to add onion, garlic, jalapeno pepper, carrots, one small potato and fresh grated ginger to soup. These I cook in a little water in the microwave on high until almost tender. Now I am ready assemble the Meatless Navy Bean Soup. The final addition to the soup seasoning is a natural mesquite liquid smoke. 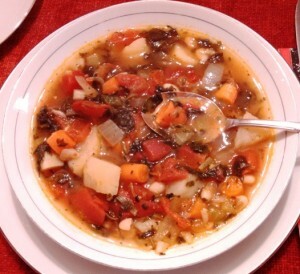 A robust Meatless Navy Bean Soup and vegetables with a subtle flavor of mesquite smoke. Makes you think you are around an old chuck wagon out west. 1 cup chicken broth or more if thinner soup is preferred. Soak the dried beans in the 4 cups of water 4-8 hours. Drain beans, cook in pressure cooker with water to cover, 11 minutes. Put 2 cups cooked beans and juice into a large pot. Add all the vegetables together in a microwave proof bowl with ¼-1/2 cup water. Microwave on high for 3-4 minutes. Add the cooked vegetables and water to the beans. Add the chicken or vegetable broth. Add the mesquite liquid smoke. Julia Ann and cookbookinabox® in partnership with Netta Belle’s Choice® bring you great recipes for your cooking experience. ©2007-2018 Netta Belle’s Choice® The Art of Gourmet Cookery cookbookinabox® “Reg. U.S. Pat. & Trdmk. Off.” Reg. “Trade-marks Canadian Intellectual Property Office. “Netta Belle’s Choice® The Art of Gourmet Cookery® cookbookinabox® All rights reserved. 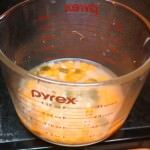 The great benefit of making any soup is the freedom to substitute or make changes as you prepare. Now of course there are times when making a specific recipe is the goal. That is the fun and challenge of cooking. 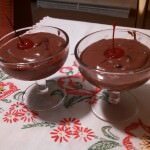 The Corn Bread and Chocolate Pudding with Maraschino Cherries are recipes to come in future blogs. 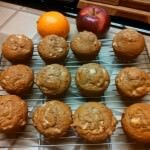 The recipes for the Wheat Flax Seed-Apple Muffins and the Orange Coconut Walnut Bowl are available. Julia Ann and cookbookinabox® in partnership with Netta Belle’s Choice® bring you great recipes, outstanding herbs and spices for your cooking experience. ©2007-2017 Netta Belle’s Choice® The Art of Gourmet Cookery® cookbookinabox® “Reg. U.S. Pat. & Trdmk. Off.” Reg. “Trade-marks Canadian Intellectual Property Office. “ Netta Belle’s Choice® The Art of Gourmet Cookery® cookbookinabox® All rights reserved. 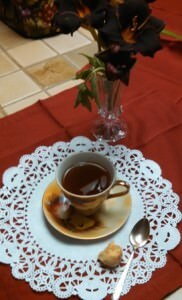 This entry was posted in Soups and tagged bean soup, ginger, meatless soup, mesquite liquid smoke, navy bean soup, vegetables on March 1, 2017 by Julia Ann. 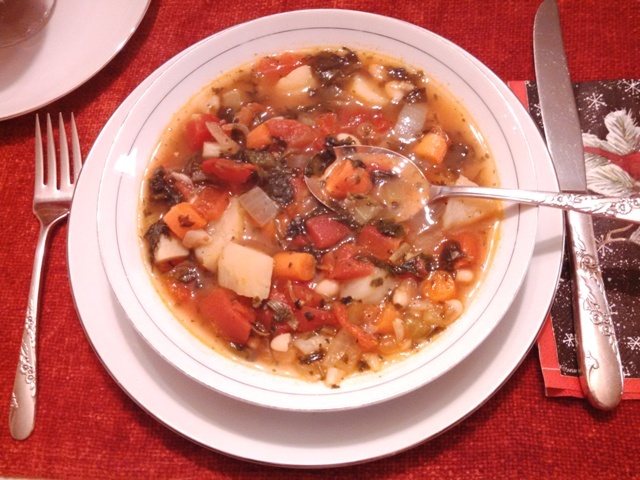 White Bean-Spinach Vegetable Soup is a good to have on hand in the freezer or a full pint jar setting in the refrigerator with soup ready to heat for a lunch. I like to have soup available for quick lunches, so when I make soup, I make 8 cups from the recipe. It is usually very thick with vegetables or the main ingredients. Because it is extra thick, I will add extra 99% fat free natural chicken broth when I reheat 2 cups of White Bean-Spinach Vegetable Soup. 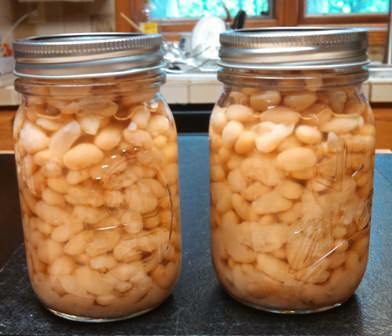 The pictures of the white beans illustrate my home cook and canning. After the kettle of soup has cooked, I put the White Bean-Spinach Vegetable Soup into clean pint jars, seal, let cool to room temperature and set the jars in my refrigerator. It helps to have an extra refrigerator on hand. These jars of soups are usually used in 2 weeks or less. 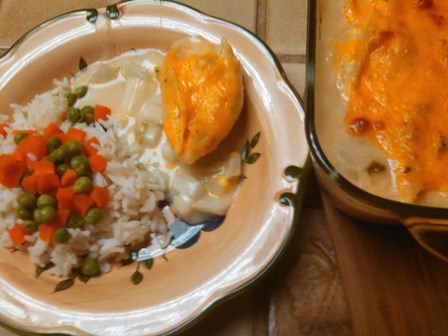 If frozen in freezer bags or plastic freezer containers, the soups could be kept longer. The choice of vegetables can vary with your likes or preferences. This is an excellent way to meet the dietary requirements of 5-13 servings of vegetables and fruits each day. Although fruit does not go in the soup, you have snacks and dessert with your meal. The beans provide fiber and protein, carrots provide vitamin A, peppers contain vitamin C, potatoes are high in potassium and spinach if rich in folate. Heart healthy soups are warming and nutritional addition to winter meals. An excellent way to meet protein, fiber, vitamins and minerals requirements. Prepare the white/navy beans or use canned beans. Chop the vegetables, onion garlic, pepper celery, carrot, ginger. Heat oil in large Dutch Oven or kettle. Add onion, garlic, celery, and carrots. Cook until onion in tender. Pour in broth and water. Bring to a boil; reduce heat and simmer. Recipe inspired from Hoosier Farmer, January-February 1998. Julia Ann and cookbookinabox® in partnership with Netta Belle’s Choice® bring you great recipes for your cooking experience.©2007-2018 Netta Belle’s Choice® The Art of Gourmet Cookery. cookbookinabox® “Reg. U.S. Pat. & Trdmk. Off.” Reg. “Trade-marks Canadian Intellectual Property Office. “ Netta Belle’s Choice® The Art of Gourmet Cookery® cookbookinabox® .All rights reserved. Julia Ann and cookbookinabox® in partnership with Netta Belle’s Choice® bring you great recipes, for your cooking experience. ©2007-20178 Netta Belle’s Choice® The Art of Gourmet Cookery® cookbookinabox® “Reg. U.S. Pat. & Trdmk. Off.” Reg. “Trade-marks Canadian Intellectual Property Office. “ Netta Belle’s Choice® The Art of Gourmet Cookery® cookbookinabox® All rights reserved. 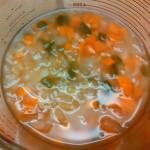 This entry was posted in Menus, Soups and tagged carrots, celery, chicken broth, garlic, ginger, navy beans, onion, peppers, spinach, tomato juice, white beans on February 10, 2016 by Julia Ann. 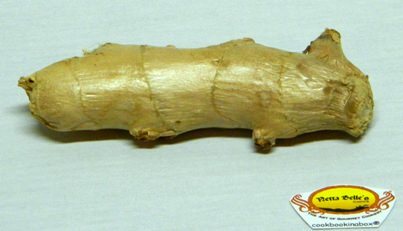 When buying fresh ginger root, be sure the root is firm, smooth and free of mold. Older roots will need to be peeled, easily done with paring knife or vegetable peeler. 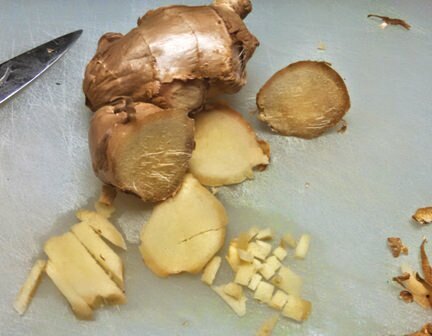 If left unpeeled, a fresh ginger root will last 3 weeks in the refrigerator and 6 weeks in the freezer. Preparing fresh Ginger Root for cooking. 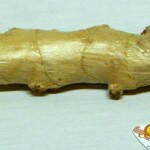 When using fresh ginger root I do not cut off any more than I will use. 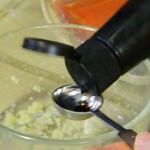 Depending on the food I am cooking, it may be diced to minced, julienned or even grated. Adding the ginger at the beginning of cooking will give a milder flavor while adding it later will have a more zesty to spicy flavor. Ginger root can be grated and put in an ice cube tray with water or in a plastic bag to freeze. When ginger root is needed, just break off what you need. 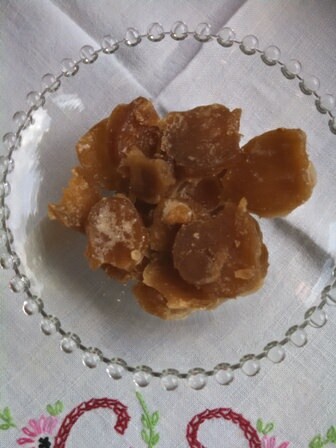 Candied ginger is available in the grocery or candy stores. 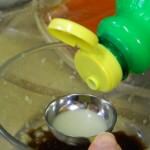 It is also easily made at home and gives you the ginger syrup. Add 3-4 slices in a cup of boiling water. Or add the slices to a cup of oolong tea or lemon tea. I had frozen the ginger root before starting this recipe. I would have preferred to have made this soon after buying the root. 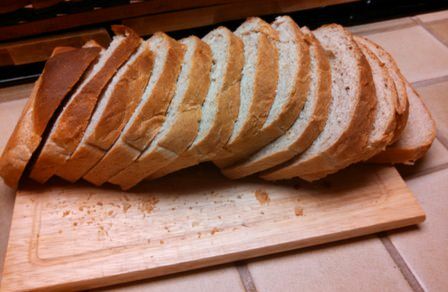 I sliced in 1/4-1/8 crosswise slices, which yielded about 1/2 cup from my pieces. I put them in a heavy saucepan and covered with plenty of water to bring to a boil. I reduced the heat, letting the ginger root simmer about 30 minutes until tender. After the boiling and simmering, I drained the water off. I put 1 cup of sugar to 1 cup of water in heavy saucepan to dissolve the sugar over low heat. The sugar which collects on the side of the pan can be wash down with a pastry brush dipped in warm water. Bring the sugar to a boil, add the ginger, reduce the heat to simmer and cook until the sugar syrup has almost boiled away. I did not cover the saucepan and stirred occasionally. The ginger and sugar foamed up while cooking but subsides when heat is turned off. 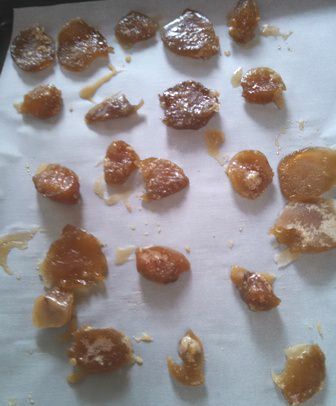 Remove the ginger root pieces and lay out on a cookie sheet covered with parchment paper to dry. It make take overnight to dry completely before storing in air tight container. ¹ The World’s Healthiest Foods “Ginger”. www.whfoods.org., June 16-22-2014. ² Adapted from Joy of Cooking.1975. p.881. cookbookinabox® in partnership with Netta Belle’s Choice® , bring you great recipes for your cooking experience. One of the advantages of social media food communities, it gets me out of my box. 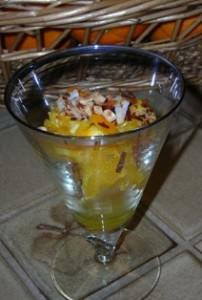 I look at all the food pictures and the recipes which give me ideas. Some I don’t adventure into as they are beautiful, but I am not ready to attempt. Those are usually beautiful to look upon are desserts and too fattening, but would be oooh so good. Hurrah for the chefs and creators! I saute shredded cabbage and apples with caraway seed. Why not try apple salad ingredients with shredded cabbage. 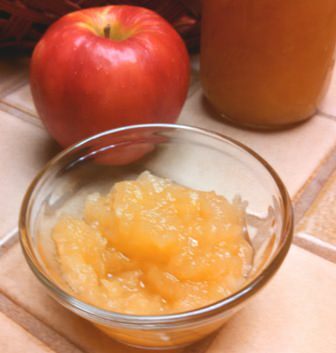 I like to use Gala apples or Golden Delicious apples, use the apple of your choice. 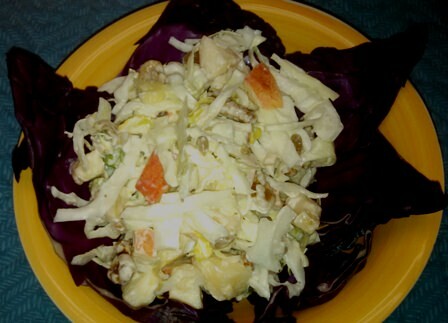 Cabbage Apple Slaw is a salad give many benefits to health. *Cabbage is high in beta-carotene, vitamin C, antioxidants for protection against disease. Apples provide fiber to maintain digestive health. Walnuts are high in vitamin E, copper and magnesium are heart-healthy nutrients. Celery is recommended to lower cholesterol levels and high blood pressure. Sunflower seeds contain plant sterols which can lower LDL cholesterol. Raisins provide potassium, fiber and iron, also to promote better heart health. Ginger aids in digestion, relieve motion sickness, and arthritis relief. A heart-healthy crispy salad of cabbage, apples, celery and walnuts. A salad for all seasons. Put the shredded cabbage in a large bowl. Dice the apples, stir in the lemon juice to prevent browning of the apples. Add apples to the bowl of cabbage. Add the celery, walnuts, sunflower seeds, raisins and ginger. Heat the honey 10 seconds in microwave to liquefy honey to enhance blending. Stir in the lemon juice, mayonnaise and celery seed. Pour over the cabbage apple slaw and stir to mix. you great recipes for your cooking experience. ©2007-2018 Netta Belle’s Choice® cookbookinabox® “Reg. U.S. Pat. & Reg. “Trade-marks Canadian Intellectual Property Office.” nettabelleschoice.com and cookbookinabox.com. All rights reserved..
*Yeager, Selene and the Editors of Prevention, The Doctors Book® of Food Remedies. 2007.
cookbookinabox® in partnership with Netta Belle’s Choice®bring you great recipes for your cooking experience. 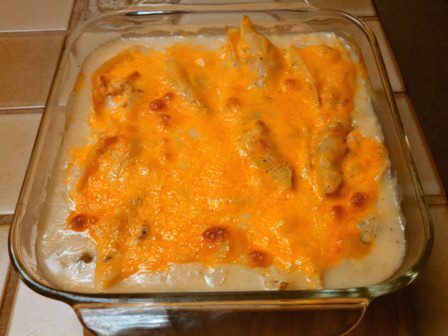 This entry was posted in Pasta and Rice, Salads and tagged apples, cabbage, celery, ginger, raisins, salad, slaw, sunflower seeds, walnuts on June 18, 2014 by Julia Ann. 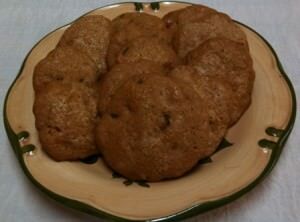 A soft spicey molasses cookie filled with walnuts and raisins. Originally called a tea cake. First published in an 1877 Portland, Maine cookbook. Grease or line cookie sheets with parchment paper. Mix the first 6 dry ingredients together; whisk to blend. Measure the molasses and water together. In a large mixing bowl, combine shortening and sugars; cream until fluffy. Reserve ½ egg; add the remainder of eggs to sugars, beat to blend. Alternate adding the dry ingredients and liquids, beating after each addition. Stir in walnuts and raisins until mixed evenly. Drop by tablespoonful on the cookie sheet. Add pinch of white sugar on top of each cookie. These can be made into a bar cookie. Cut when warm and store to soften. nettabelleschoice.com and cookbookinabox.com. All rights reserved. 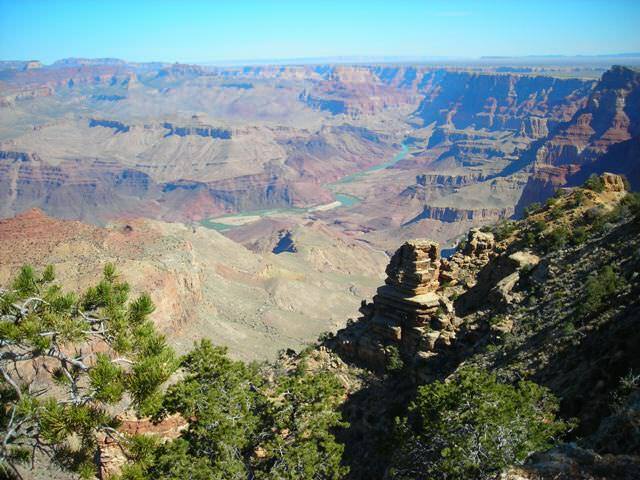 The Grand Canyon is a special spot our family likes to visit. There is a fun train excursion from Williams, Arizona up to the Grand Canyon. Certainly family oriented. It is a must see place to visit each time we go to Arizona. It is fun to walk around the El Tovar Lodge on the south rim, visit the shops and see the elk, ride the bus to lookout points over the Canyon and breathe the western air. I like the the southwest. Now what does that have to do with cookies? I remembered a cookbook I got at a used bookstore in Flagstaff, The Grand Canyon Pioneers Society Cook Book, 1988 edition. Gale Burak baked Gale’s Hermit Cookies to take to the Grand Canyon Ranger Stations. I have renamed them Grand Canyon Hermit Cookies and bake them as a drop cookie. Enjoy the old fashioned flavor of Grand Canyon Hermit Cookies. This entry was posted in Desserts and tagged cinnamon, cookie, Cookies, ginger, molasses, raisins, spicey on November 22, 2013 by Julia Ann. Salmon and bok choy before microwave steaming. How do you buy your salmon? I really like it fresh, though sometimes for economy and time-saving, frozen from a ‘big box store’ is easiest. I always look to see how and where the salmon grew up. When possible, I will get a fresh large filet and cut into serving sizes and freeze remainder for later use. Most of my recipes for salmon are broiled or baked, sometimes sautéed. 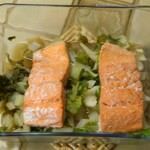 The Microwave Steamed Salmon and Bok Choy is a one dish meal with no extra oil or fat added. 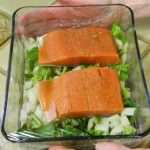 When using frozen salmon filets, thaw in refrigerator. 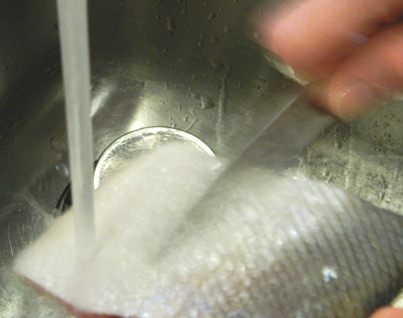 To prepare, wash and remove scales from salmon, rinse and dry. Washing and cleaning the scales off the salmon filet. Diet wise, it is smart to eat salmon at least once a week. 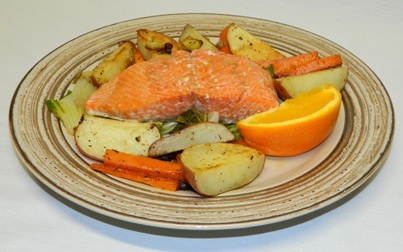 The omega-3, high in protein, and vitamins D, B12 and 6 are all found in the salmon. Canned salmon has all the same nutrients plus calcium because the bones are included. When first married, salmon patties were the last resort meal before the next pay-day. I am sure some of you can relate. There are so many vegetables available that I did not see when first married, soon to be 50 years ago. Bok choy is one. Bok choy, also known as Chinese cabbage. It is good in stir-fry, addition to chicken soup or even chicken broth for a light soup. 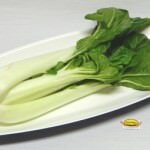 It is a vegetable to be eaten raw in salads or in coleslaw Bok choy is a zero calorie recommended vegetable. It is rich in vitamins A, C and K as well as potassium and calcium to name a few. Thoroughly wash bok choy stalks and leaves to remove dirt and grit. 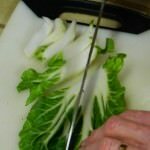 Cut the wide stalks in half lengthwise and slice both the white stalk and leaves into 1/2-inch pieces. Put the bok choy in the bottom of a microwave dish. Lay the salmon filets on top. In a small bowl, mix the ginger, reduced-sodium soy sauce and lemon juice. Pour over the filets and bok choy. Cover the dish with plastic wrap, leaving a corner uncovered to vent. Adding the reduced-sodium soy sauce. 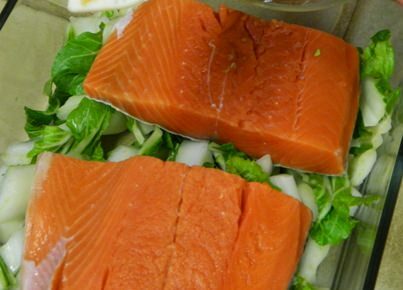 Microwave the salmon and bok choy 5-9 minutes on high. The salmon will be light pink in the center and tender when done. Lightly prick the filets with a fork to test for flakiness. A healthy one-dish meal without extra oil or fat added. Gain the benefits of omega-3 and protein of salmon and zero bok choy calories. 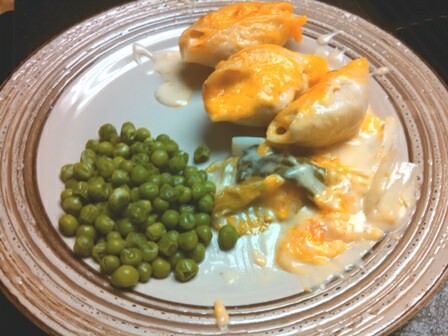 Prepare in a microwave casserole. 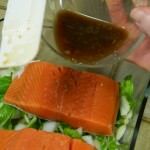 Wash and remove scales from salmon, marinate in 1-2 tablespoons lemon juice. Thoroughly wash bok choy to remove dirt and grit. Cut leaves and stalk in half lengthwise, slice into ½-inch pieces. Place bok choy in the bottom of casserole. 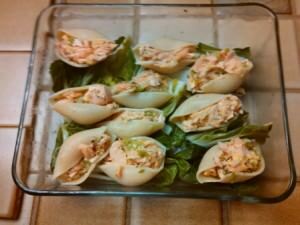 Drain and dry salmon, place on top of bok choy. In a small bowl, mix the ginger, soy sauce and lemon juice. Pour over salmon and bok choy. Cover with plastic wrap, leaving corner uncovered to vent. Microwave dish 5-9 minutes on high. 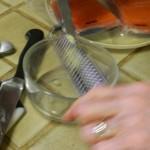 Salmon will be flaky when pricked with a fork to test for doneness. For this particular meal, I roasted root vegetables to serve with the microwave steamed salmon with bok choy. Microwave steamed salmon with bok choy and roasted root vegetables. This entry was posted in How-To, Seafood and tagged bok choy, ginger, microwave, salmon, soy sauce on September 20, 2013 by Julia Ann.